The rock graves of Caunos,which are opposite the locality Dalyan a a steep mountain-slope,did not lose their splendour for thousands of years. The 2500 years of old king graves from Kaunos are as in the first years splendid.They cannot turn away their views from the graves,This region was once under the rule of the Carian.However the antique city Caunos had is own culture and was independent, the city is surrounded with a wall,which shows different building phases.In the centre the Greek-roman theatre,the hot spring system,the Agora,business,the port etc.. The total population of the city had never been over 4000 people. A large part of the Caunian with fishery,fig breed,cattle breeding,and maritime trade concerned themselves.After the 8.Jh.n.Chr.a part of the urban population became settled as a worker in Aegean. The city lives on with the Caunos legend. It is said that the king Miletos had a twin. A son named Caunos and daughter named Byblis. The legend says that Caunos and Byblis had a forbidden love affair and when father Miletos found out, he banded his son Caunos from the city. Caunos came into this region and created here his own city with his own name.The city had a very important port back then. Caunos, the son of Miletos, had been indicated as the founder of the city and therefore, it had been named Caunos. The city was first captured by the Persians and then by Alexander and in the year 189 B.C., it was made subject to the Kingdom of Rhodes. We know that it continued until the year 167 B.C. Caunos was subjected to the kingdom of Pergamon and was brought directly under the sovereignity of Rome after 133 B.C. 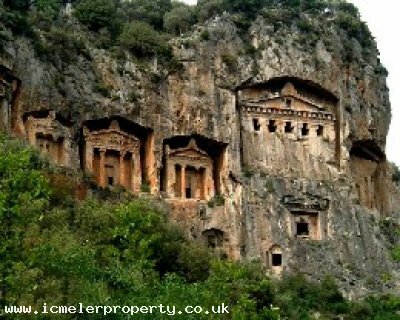 You reach the site of the ruins by means of channel adorned with Lycian type tombs belonging to the 4th century B.C. The first place that you will see is the acropolis of Caunos. The northern part of the city wall, which surrounds the acropolis, belongs to the period of Mausolos. The northwestern part has Hellenistic qualities. And from the harbour you will see the city walls of Cyclopean type belonging to the Archaic Period.The theater belonging to the Roman Period is located at the skirt of the acropolis and its southern part is carved in the rock; the other parts are shaped into seats supported by gable roof vaults. There are 33 rows of seats, the scene has collapsed and the part of the orchestra has been filled in.A temple, revealed by the recent excavations, is located at far west of the theater, and a church and the magnificent walls of the Roman Bath are visible beyond it. Another temple belonging to the Roman Period is located behind the bath.